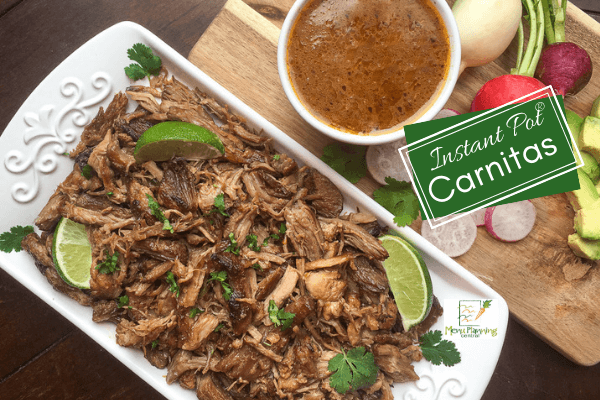 This Easy Instant Pot® Carnitas recipe turns out soooo tender and juicy and is loaded with so much flavor. This pressure cooker Mexican carnitas recipe is extremely versatile allowing the fall-apart-tender pork to be served in so many different ways. 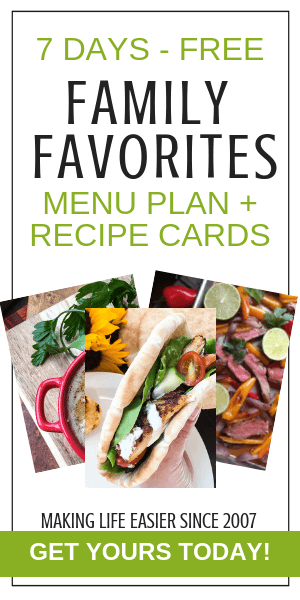 The beautifully seasoned, tender Mexican pork is delicious on its own, but a few of my favorite ways to serve it is in festive tacos, healthy lettuce wraps, in salads, or even served over rice. The instructions for this recipe include a couple of optional steps that can be omitted if you are crunched for time. 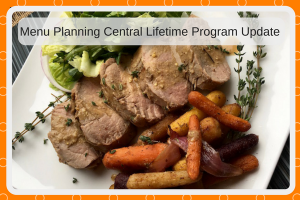 For example, the aromatic blend of onion, jalapeno, and garlic does not need to be sautéed before cooking the pork, but doing so deepens and releases the most flavor. Additionally, the pork can be shredded and served as soon as it is finished cooking. The extra step of tossing it with some of that gorgeous cooking liquid and broiling under high heat delivers the golden delicious, crispy edges found in traditional carnitas recipes. You could, of course, skip this step, but I highly recommend taking the extra few minutes. It really brings out the very best flavor! 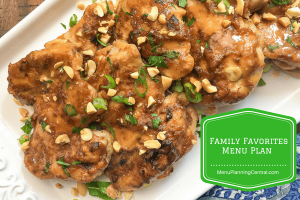 This easy and delicious recipe is part of our Family Favorites Menu Plans. 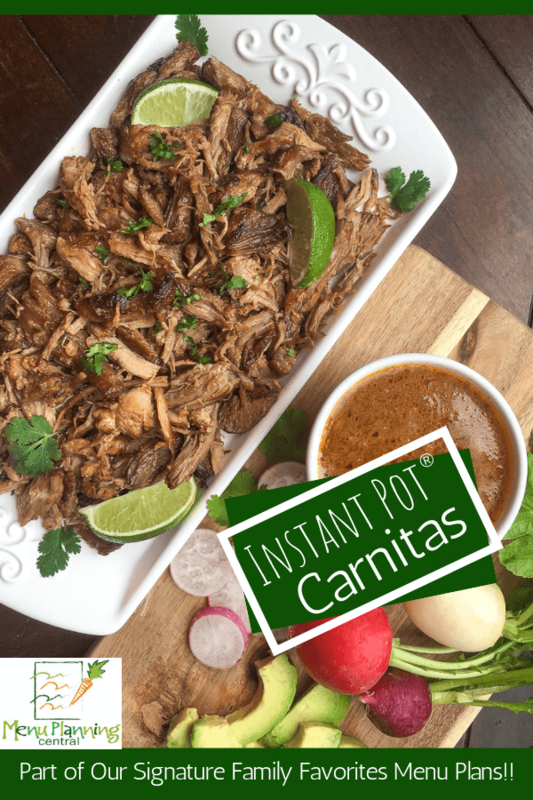 Easy Instant Pot® Carnitas recipe. Juicy, tender, and loaded with great Mexican flavor. Push the “Sauté” button on Instant Pot®. Once the display reads “On,” add 1 tablespoon olive oil and half the pork shoulder pieces to the container. Season with salt and black pepper, to taste, and cook until pork is browned on all sides, approximately 1-2 minutes per side. Note: DO NOT use lid while using the “Sauté” function on an Instant Pot®! Press the “Manual” button and set the time to 30 minutes at high pressure. Once the cooking time is up, allow 20-25 minutes for the “natural release” of the steam inside the Instant Pot®. After that time, perform a manual “quick release” to vent any remaining steam to release lid, if necessary. A few minutes before the steam is fully released, preheat oven broiler to high and line a large, rimmed baking sheet with aluminum foil. Transfer pork to the prepared baking sheet and gently shred with two forks. Drizzle with ¼ cup juices from the Instant Pot® and toss to combine before spreading into a thin, even layer. Important - Different Instant Pot® models and other electric pressure cookers offer different features and buttons. (These instructions are for the IP-Duo series).